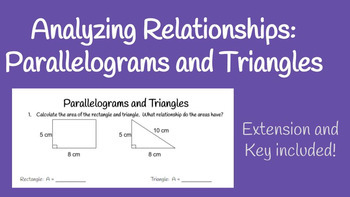 Students will calculate the area of pairs of parallelograms and triangles that have the same base and height. This helps students to see that the area of a triangle will always be half the area of a parallelogram. I have students work in groups, but you could easily use this as an assessment or homework resource. An extension activity and KEY are included!